Courtesy of John Agee, M.D. 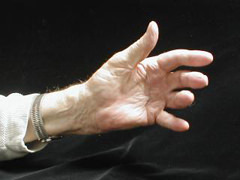 This case study involves an 83-year-old man with severe Dupuytren’s Contracture of the PIP and MCP joints of his long and ring fingers. He has had no prior surgery. The patient sought treatment because he was no longer able to hold a golf club. 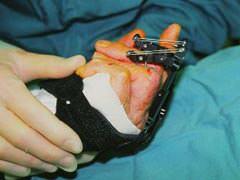 Prior to performing a fasciectomy, Dr. Agee decided to use Digit Widgets on both affected fingers to facilitate access to the palm and fingers. The Digit Widgets were applied and the Dupuytren’s bands in the palm were cut, but not excised. The patient progressed to wearing heavy elastic bands 24 hours a day, seven days a week without any pin tract problems, pain or swelling. 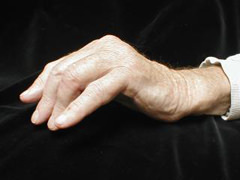 After five weeks, he had gained 35º extension on both PIP joints. At this point, Dr. Agee performed a subtotal palmar fasciectomy. 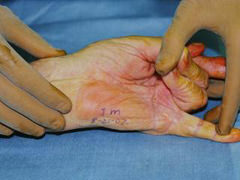 Skin grafts were not necessary, however, there was considerable skin shortage after surgery. The elastic band torque was re-applied one week after fasciectomy. He wore the devices for another three weeks. 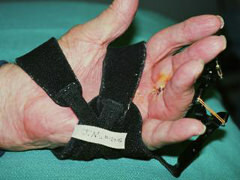 During this time, the patient gained another 20º extension on the long finger and 38º on his ring finger. His ROM graph showed a continuing gain in motion but after eight weeks of wearing time, the patient requested that the Digit Widgets be removed. 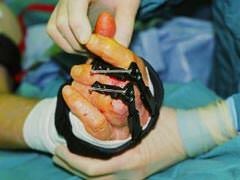 Once removed, he was referred to Hand Therapy for splinting and plaster casting as needed. He was seen a total of six times in therapy. 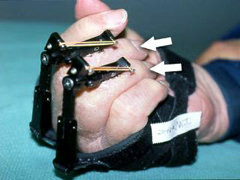 One month after the devices were removed, the patient showed excellent functional flexion and he had gained 60º extension on the PIP of the long finger and 74º on the PIP of the ring finger. 8/21/02. 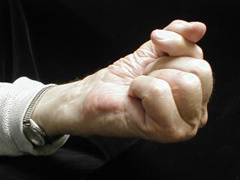 Left-hand of 83 year-old-male suffering from Dupuytren’s Disease on long and ring fingers. Photo taken prior to Digit Widgets. Two Digit Widgets were applied and the palmar bands were released, but not excised. Surgery performed: Application of two Digit Widgets, release of palmar bands without excision. 8/21/02. Post Digit Widget application. 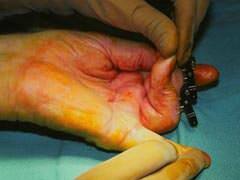 Extensor torque was initiated at the time of surgery. Light weight bands were applied and the patient was instructed to wear the torque 23/24 hours per day. 9/26/02. After five weeks, PIP extension is now adequate to allow Dupuytren’s Contracture release of MCP and PIP joints with subtotal palmar fasciectomy. 10/24/02. The Digit Widget has been worn for a total of 8 weeks; here he is 3 weeks post fasciectomy. His ROM is still improving, but he wants the devices removed. * Flexion measured against the resistance of the heaviest elastic band. Prior flexion measurements were taken with the bands removed. 10/24/02. Active flexion with Digit Widgets in place. Note that bone pin placement does not restrict extensor tendon excursion and the patient has excellent DIP motion. 11/26/02. Four weeks after Digit Widget removal demonstrating maximum active extension. Patient has been to six hand therapy sessions for progressive splinting, serial plaster casting and ROM exercises. He still has significant MCP joint flexion contractures. 11/26/02. Maximum active extension. Maximum active flexion.